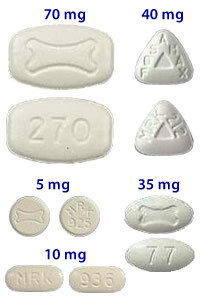 Fosamax or alendronate sodium is a FDA approved medication, produced by Merck & Co., Inc. and belonging to the pharmaceutical group of bisphosphonates. The medication influences the process of the bone formation, slowing down the bone loss in order to protect bones from fractures and eliminate their fragility. Most frequently bones are getting weaker in women, entering the period of menopause, and men, who take steroids for a long period. In these cases the medication is prescribed as a preventive measure against the development of osteoporosis, yet it can also be used by the men who are already suffering from this condition in order to promote the increase of the bone mass. Paget's disease of bone is another indication for the prescription of Fosamax. At present the brand-name medication and its generic have a license for sale in the USA. Generic form of the drug contains the same active ingredient as the brand-name one and provides the same efficient treatment. Store your medicines at room temperature in a dry place where children can't reach them. The medication is taken orally. The offered dosages suppose daily or weekly intake. A liquid solution is an alternative for people, having a problem with the pill swallowing. It's recommended to combine the Fosamax therapy with the calcium and vitamin D intake to provide the organism with all the necessary materials for the healthy bone formation. It's a bone disease, characterized by the the process of bone thinning. 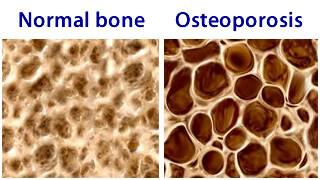 In patients, who suffer from osteoporosis, bones acquire a porous structure, losing their mass, which leads towards extra bone fragility and is fraught with high risks of fractures. This condition affects both men and women. Among the factors, causing osteoporosis, there are the following: old age, excessive alcohol consumption, smoking and long-term use of steroids. The condition can be prevented and effectively treated. Besides, its prevention shouldn't be underestimated, as the disease itself doesn't reveal through the pronounced symptoms. Patients usually get to know that they have osteoporosis when they break a bone. However, there are special tests to diagnose the condition and work on its prevention. Normal bone functioning includes the phases of the break down and rebuild. In the course of the Paget's disease the break down phase is followed by the abnormal rebuild. The reformed bone turns out to be weaker than it's supposed to be. The condition may reveal itself through bone pain, bent or broken bones. Fosamax can improve the process of bone reformation, strengthening the bone tissue when it's being rebuilt and make the break down phase happen slower. The medication is recommended to the patients, who suffer from the symptoms of Paget's disease and may have further complications, associated with the condition, as well as those with high alkaline phosphatase levels. Fosamax may be also recommended for the treatment of such conditions, as hypercalcemia (high level of calcium in blood) or bone cancer. Can children use the medication? The medicine hasn't been improved for children. There have been studies related to the osteogenesis imperfecta treatment in children, however, they haven't proved scientifically the drug efficience in regards to this condition. To obtain a full-value effect from the course of medication, you need to take it as prescribed in the dosage, duration and other recommendations below. Vitamin D and calcium supplements are recommended to be taken in the complex with Fosamax. Not only they are indispensable elements for the normal formation of healthy strong bones, but they are also necessary for the proper work of the medication. The drug is taken orally (by mouth) every day or once a week. You may opt for tablets or liquid form if you feel discomfort when swallowing pills. The medicine has to be taken in the morning on empty stomach. Take the medication not less than 30 minutes prior to food or beverage (except for water) consumption or taking other drug.To avoid food, beverages or other active ingredients to interact with the medication and prevent its absorption into the blood stream is an important condition. Take a tablet with a glass of plain water. Don't substitute water by tea, coffee, soda, any other beverage or mineral water due to the reason, mentioned above. The liquid form is also taken with water. In this case, you should take less water � approximately ¼ of a glass. To avoid irritation to the esophagus don't lie down after taking a pill. Stay in the upright position also after you eat. When swallowing the tablet, don't break or chew it either. Just take it, drinking a glass of water. In case of any uncertainties, concerning the drug, its dosage and how to take it, talk to your doctor or healthcare provider. Dosage for the osteoporosis treatment: 70 mg once weekly or 10 mg once daily. Dosage for the osteoporosis prevention: 35 mg once weekly or 5 mg once daily. Dosage for the Paget's disease treatment: 40 mg once daily during 6 months. Generally, it's 5 mg once daily, however, if osteoporosis is caused by the long-term steroid use in women during menopause and the estrogen hormone replacement therapy isn't taken at the same time, a higher dosage is recommended - 10 mg once every day. If you have read the previews about the Fosamax efficiency and got interested in the medication, you may consider the course of treatment or prevention of bone-related conditions. However, be aware, there are certain warnings and precautions you should take into account before you start your therapy. A prior consultation with a medical professional will let you get maximal benefits from the treatment. 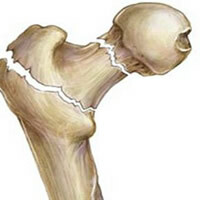 Unusual fractures of the thigh bone are reported in some cases when patients have been taking bisphosphonates, like Fosamax. However, there's no clear evidence if those fractures were caused by the medication or not. They, definitely, were not caused by any injury or trauma. But they might have been caused by the developing osteoporosis as well. That's why if you've got sudden alarming pain in the thigh, indicating possible thigh fracture, you must let your physician or healthcare provider know about it. Bisphosphonates may also cause osteonecrosis of the jaw, quite rarely though. This condition is accompanied by pain, inflammation, infection, teeth loss, which eventually lead towards the destruction of the jaw bone. Though there may be no evident symptoms until the jaw bone gets exposed. People, who undergo dental procedures, like a tooth extraction, for instance, while taking the medication, have a possibility to develop this condition. Having frequent dental examinations and taking good care about your mouth cavity and teeth will help to reduce the risk. Contact your healthcare professional if you notice any symptoms that may lead towards the osteonecrosis of the jaw. Remember that Fosamax has to be taken in complex with vitamin D and calcium. These elements help the medication to build strong bones. Besides, without them your therapy will be inefficient, as the medication needs them to do the proper work in your body. You may get the supply of vitamin D and calcium through meals or as food supplements. Bisphosphonates may also cause problems with your esophagus and stomach. Such conditions as heartburn, indigestion or even development of ulcers may turn out to be unpleasant side effects of the medication. That's why, if you have the predisposition towards these conditions, you must let your healthcare provider know about it. 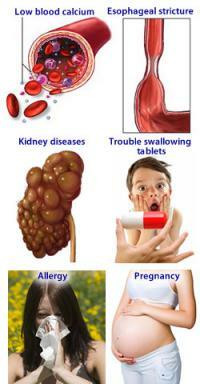 Patients with serious kidney conditions, should avoid the medication. 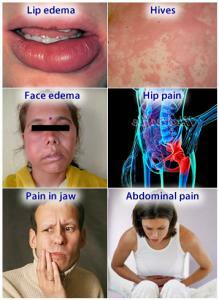 Other side effects, you may encounter, include muscle and bone pain. However, these symptoms usually stop once you've stopped taking the medicine. It's better to avoid a therapy with the drug during pregnancy. You should be also careful about taking this therapy if you are breastfeeding or planning to start breastfeeding. There's no evidence proving that the medication can pass through the breast milk to your baby, though it's better to discuss this point with your healthcare provider. When taking the medication, you are supposed to follow all the instructions strictly in order to reduce or avoid side effects and any health complications. 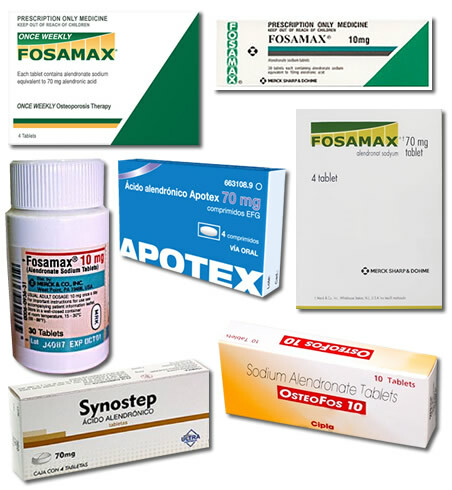 Be aware also that Fosamax may interact with other drugs, which may influence the efficiency of your therapy. In case you are experiencing any of these symptoms, you must stop taking the medication and seek for the immediate medical attendance. You must also let your doctor know about the mild side effects, you are experiencing. There may be more side effects from the medication. We have listed the most typical ones. Mineral matrix of bone includes hydroxyapatite - calcium apatite mineral form. Alendronate is similar to hydroxyapatite and it triggers the process of farnesyl pyrophosphate (FPP) production. FPP is an enzyme in the mevalonate pathway. 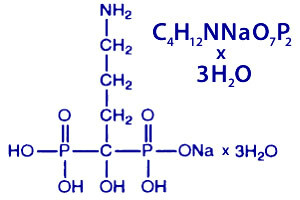 The group of medicines, called bisphosphonates (including Fosamax), contain nitrogen and produce the same action in the organism as isoprenoid diphosphate lipids, inhibiting FPP production. When this enzyme is inhibited in osteoclasts, biosynthesis of isoprenoid lipids is prevented. Thus, the osteoclast activity is inhibited, which leads towards the reduction of resorption and turnover in the bones and acceleration of the bone mass gain. These effects are especially effective for menopausal women. Merck & Co was the first pharmaceutical company that discovered and began to sell the medication. From September 1995 till 2008 Merck & Co was the only company, selling the drug, which brought to the pharmaceutical giant total $3 billion from the sales. Although Merck & Co strove to keep a monopoly for the Fosamax sales and block its generics, the company's patent expired by 2008 and in February of 2008 the first generic alendronate was FDA approved. Barr Pharmaceuticals and Teva Pharmaceuticals USA, which subsequently joined into one company, got the patent for the sales of the first drug generics. Merck & Co is still selling the brand-name medication Fosamax+D, that is a drug version with vitamin D additive. Only by 2007 the medication had been prescribed to more than 20 million patients. After a patent for the sales of the brand-name medication, owned by Merck & Co., Inc, expired in 2008, generics of Fosamax were FDA approved. Merck & Co., Inc still sells the brand-name drug, however, generics today seem to be more cost-efficient. The generic tablets are available in the strengths of: 5 mg, 10 mg, 35 mg, 40 mg, 70 mg.
What's the difference between the brand-name Fosamax and its generics? All brand-name medications, as well as their generics, have to be approved by the Food and Drug Administration before they can be marketed. FDA takes necessary tests to define whether the generics are equivalent in their active ingredients, action and effects to the brand-name medications. The generics get ratings, assigned from the FDA. If a generic form meets all the requirements, it's assigned "AB" rating. 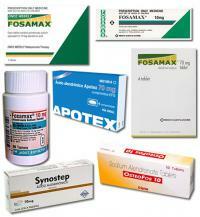 Fosamax generics have got AB rating which means they are equivalent to the brand-name medication. The only difference between generics and the brand-name medication is the composition of inactive ingredients (dyes, fillers, etc.) This option may be a problem for the patients who have allergies to these inactive ingredients. That's why it's important to clear this issue up with your healthcare provider before you start taking the medication.